Some quick house-cleaning/sausage making updates before I proceed with today’s post. Since we here at Chasing Amazing pride ourselves on creating content that both looks back and looks forward at the Spider-Man universe (two days a week and sometimes a third, if I’m feeling saucy), I thought I’d use the “look back” slot on this blog to occasionally examine some ASM runs from past and present rather than focusing exclusively on the minutiae of my acquisition of said comics. These entries will be categorized under “Random Runs of Spidey.” In the case of this post, part two of the run will run in the “retro” post slot next week. Amazing Spider-Man #143 captures everything I love and everything I abhor about the Bronze Age era of Spider-Man in one neat, tidy little package. The bulk of the Gerry Conway/Ross Andru run on ASM is mostly lost and/or disregarded by me, so much so that when an homage to ASM #143’s one extremely historic panel was featured in a recent issue of Superior Spider-Man, I had to do some sleuthing to determine where the original moment transpired. 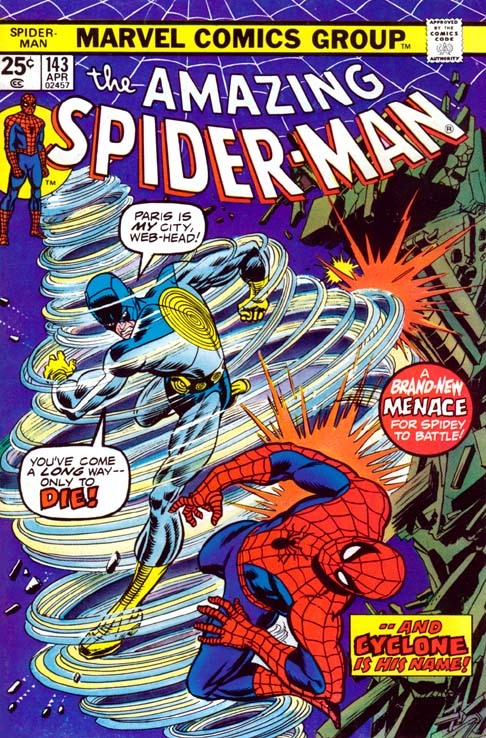 Granted the bulk of the Bronze Age occurred before I was even born, but beyond that, these ASM comics – even the more famous ones – just fail to make an impression on me. Outside of the “Death of Gwen Stacy” arc in ASM #121-122 and the first Punisher (ASM #129), the title offers me very little until Roger Stern jumps on board as head writer in the mid-1980s. Of course the moment in question here is the extremely passionate first kiss between Peter Parker and Mary Jane Watson. At this point in history, Peter is barely 20 issues removed from the death of his first true love, Gwen Stacy and MJ was evolving from flighty party girl to a more serious supporting character (which we first saw in ASM #122’s dramatic ending). 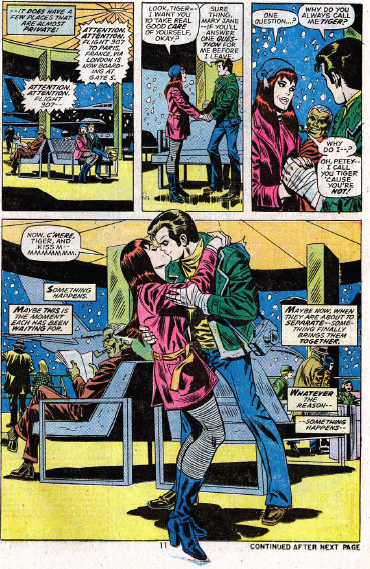 What I always thought was so great about this scene beyond just the implications it held for the two characters (which would later come to pass under the editorial reign of Jim Shooter in the 1980s) was how Peter’s romantic gesture was in many ways a tactic geared towards proving Mary Jane wrong. The two are at the airport (Peter is going to Paris with Robbie Robertson to retrieve J. Jonah Jameson, who’s been kidnapped and being held for ransom by a mysterious person) when Peter asks MJ about her “Tiger” nickname for him (made most famous here). MJ’s response is, to be honest, a little emasculating – “I call you tiger because you’re not.” So Peter goes all “how do you like them apples,” on MJ, creating probably one of the more memorable panels of the Andru-era. Meanwhile, Conway aptly predicts that something has “changed” for the couple – though it would take nearly another decade for that to be consummated. All the same, it’s a great character moment for Peter. Despite the fact that he was romantically involved for years with one of the most beautiful and intelligent women in the entire Marvel universe, MJ’s comment, inadvertently or not, harkens back to the Parker “wallflower” days of ASM’s early issues. But rather than being wounded by the comment, Peter assets himself and proves he indeed, IS a tiger. Meanwhile, MJ finds herself all alone at one of the world’s biggest airports. Sure the panel isn’t remotely based in reality, but at least it conveys just how much MJ’s socks were knocked off by the moment. While I love this scene, I think it’s also worth considering the context. Readers today have the power of hindsight to look back on this as a significant moment between two characters who would go on to have legitimate history with each other. But if I was reading this at the time it came out, I have to wonder if I would think the wounds of Gwen’s death would still be too fresh for Peter to be taking a chance like this. Of course the second part of this arc (to be discussed next week), ultimately deal with those fresh wounds when a certain clone makes her presence known. 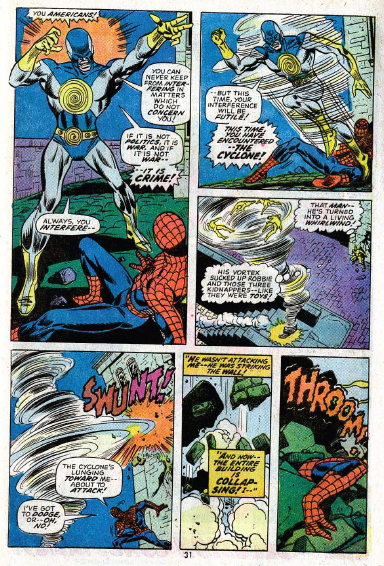 Alas, once this moment has passed, the issue falls into pure ASM Bronze Age mode. 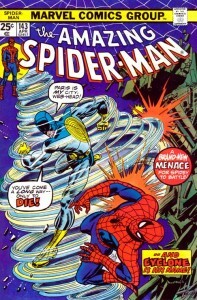 The issue marks the debut of the villain Cyclone – one of many lame and promptly forgotten villains introduced as fearful adversaries for Spidey during this era (see also Grizzly and Gibbon). The issue’s second half also features a number of potentially problematic plot devices that ultimately back Conway and Andru into a corner (How is Peter REALLY going to explain how Spider-Man followed him to France? And why is this French “supervillain” so interested in JJJ?). So while we’ll always have that fantastic kiss between Peter and MJ, the issue is completely forgettable afterwards, which explains why I had to research when that kiss happened when Dan Slott and Ryan Stegman referenced it in Superior Spider-Man #2 a few months ago. Tune in next week as I talk about European stereotypes and clones in the second part of “The Delusion Conspiracy” arc in ASM #144.